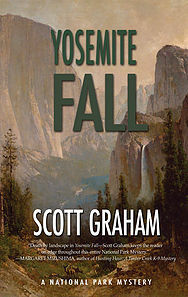 Archaeologist Chuck Bender arrives with his family in the beautiful Yosemite Valley to study the 150-year-old murders of a pair of gold prospectors. In the midst of Chuck’s work, preparations for the annual Yosemite Slam rock-climbing competition, and a reunion with his old climbing buddies, the trip quickly turns threatening. One climber never shows up, climbing equipment fails, and Chuck and his wife, Janelle Ortega, are suspected in the shocking, present-day death of one of Chuck’s former rock-climbing partners. Together, Chuck and Janelle race against time to solve the dual mysteries and prove their innocence—all while facing down a ruthless killer on the loose.